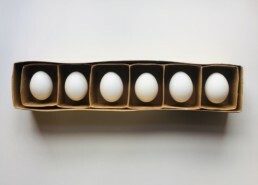 Six Special Eggs lie in a frame specially made to display and protect them. Why are they special? What makes them special? Are they too special to eat? A terminology imposed onto the eggs transforms them, elevates them, separates them. What makes these eggs different from other eggs?